Comfortable salon. The dimensions and layout of the interior remained the same. The new finishing material has an original structure. In luxury versions, inlay from natural wood is of higher quality. The original blue illumination of the lower part of the passenger compartment repeats the illumination of the keys on the center console and doors. A wireless charging for the mobile phone is available to the driver. Both front seats are equipped with a micro-elevator and effective lateral support, which reliably keeps the driver and passenger in high-speed turns …. From the traditional analog devices, only the speedometer with a pointer pointing device for fuel level and a tachometer with coolant temperature indicator remained. A 4.3-inch navigation digital display on the dashboard is now compatible with the 7-inch display of the multimedia system. In addition to the motion parameters, the information on it and the tracks played or the current radio wave is displayed on it. 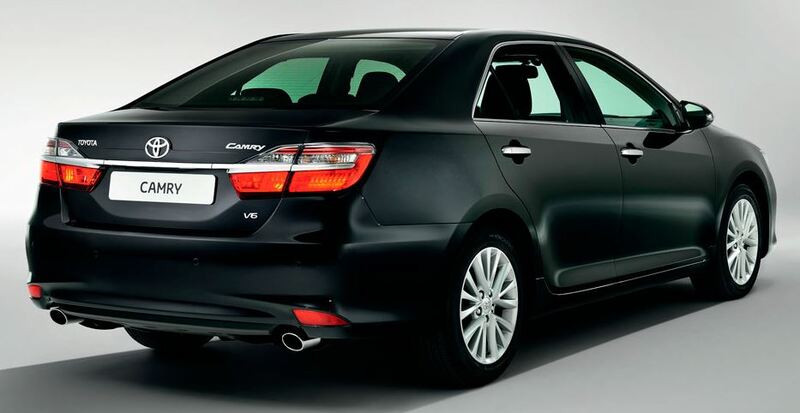 The base version of the Toyota Camry 2016 is equipped with six airbags, a new generation of ABS, an emergency brake warning system, ASR, BAS and ESP systems, and blind control systems and an on-board radar that allows early detection of interference on the roadway. Dimensions of the Toyota Camry in 2016 grew slightly in size. the wheelbase by 10 mm: Length – 4,870 mm. The width is 1 825 mm. The height is 1 480 mm. The wheelbase is 2 785 mm. The clearance is 160 mm. 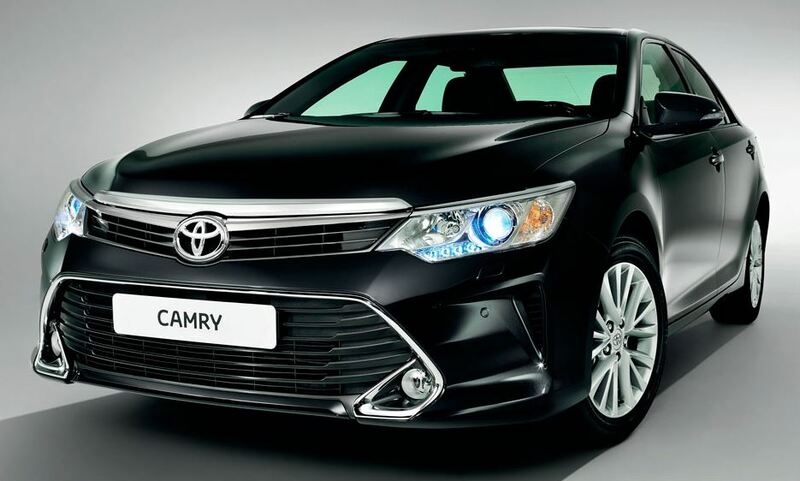 The powertrains and transmission of the Toyota Camry 2016 can not yet boast of completely renewed engines. Three power plants were unchanged from the previous generation, but a new motor also appeared: The four-cylinder engine – a volume of 2 liters, a power of 150 hp. The innovative engine is equipped with an electronic system that controls the phases of the gas distribution, as well as combined fuel injection. The four-cylinder engine is 2.5 liters capacity, 180 horsepower. The six-cylinder engine is 3.5 liters capacity, 270 horsepower. Hybrid power plant with a power of 200 hp. All engines comply with the environmental standard Euro 4 and are designed for consumption of 95th gasoline. At the moment, all versions of the sedan are planned to be completed with a six-speed automatic transmission. The hybrid engine is aggregated with the E-CVT variator. The front-wheel drive sedan, as before, is based on a platform using the McPherson strut in the front suspension and the rear multi-link system. Would you like this car?